Northern Tablelands MP Adam Marshall inspecting the new Rural Fire Service car prop at the New England Zone headquarters this morning with some of the boys from BackTrack Armidale. MEMBER for Northern Tablelands Adam Marshall joined local Rural Fire Service (RFS) and BackTrack team members in Armidale this morning as the latest innovation in firefighting was unveiled in a red-hot ceremony. The focus of the attention was a streamlined car body fitted with gas jets so that a simulated car fire can be turned on and off at the flick of a switch. 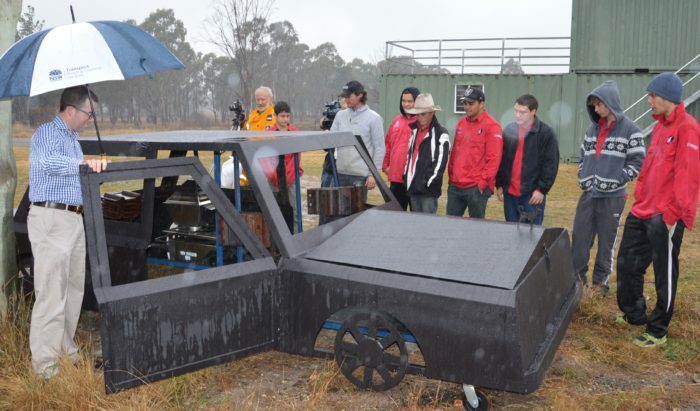 Mr Marshall said the training prop was developed by BackTrack in conjunction with the RFS New England Zone using part of a $50,000 NSW Government Youth Opportunities Grant which was announced earlier this year. “This is a great outcome and, once again, the BackTrack team came up with results that are truly innovative and impressive,” Mr Marshall said. “The RFS has developed a great relationship with BackTrack and the remainder of the grant has been used to train volunteers to assist the RFS Aviation Unit in times of bushfires. “I am pleased that the grant allowed this work to be done and provide another great opportunity to showcase the work that BackTrack and the RFS has done in encouraging young people and teaching them valuable skills. The local MP was joined by BackTrack Co-ordinator Michelle Rottcher and RFS New England Zone Manager Superintendent Steve Mepham at the RFS New England headquarters for the firing up of the car prop. “The BackTrack team worked on this project for several months, putting their extensive welding skills to great use,” Ms Rottcher said. “During the construction, the RFS worked closely with the team to check on the design and construction, it resulted in the development of a close relationship between the students and the RFS members. Superintendent Mepham said the RFS would make immediate and good use of the prop which provides significant advantages over previous training methods. “There are 1,300 volunteers in the RFS New England Zone, they encounter a wide range of fires and conditions, so ongoing and realistic training really is vital in keeping them safe,” Superintendent Mepham said. “We are very grateful the project is completed and thrilled with the end result, it means greater safety, less pollution and we can re-use it for many years to come. Keep up with the latest news from Adam Marshall and your region. Adam Marshall is the Member for Northern Tablelands in the NSW Parliament, Minister for Tourism and Major Events, and Assistant Minister for Skills. Having grown up of a farming property near Gunnedah, in the state’s North West, Adam is proud to have always lived and worked in country NSW. He attended Gunnedah South Public School then Farrer Memorial Agricultural High School in Tamworth.